A goitre or goiter (Latin: struma), also called a bronchocele, is a swelling in the neck (just below Adam's apple or larynx). 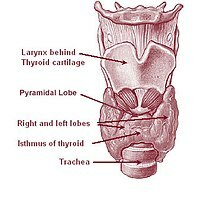 It happens when the thyroid gland gets larger (usually because the body is not getting enough iodine). A diffuse goitre is a goitre that has spread through all of the thyroid. A diffuse goitre can be a "simple goitre" or a "multi nodular goitre." Toxic goiter is a goitre with hyperthyroidism. These most commonly caused by Graves disease, but they can also be caused by inflammation or a multinodular goitre. Any other type of goitre is called a non-toxic goitre. These may be caused by lithium, some kinds of autoimmune diseases, or other problems. People with non-toxic goiters have low thyroid levels (hypothyroidism) or normal thyroid levels. New research says that some people may be more vulnerable to goitre (more likely to have goiters) because they inherited that vulnerability (it was passed down to them from their parents). Within two years of each other, President George H. W. Bush and his wife Barbara Bush both were diagnosed with Graves disease and larger-than-normal thyroid glands. President Bush's disease caused hyperthyroidism and cardiac dysrhythmia (irregular heart rate). Kim Il-sung suffers from goitre. ↑ The Health and Medical History of President George Bush DoctorZebra.com. 8 August 2004. Retrieved 8 October 2006. This page was last changed on 14 November 2018, at 11:40.